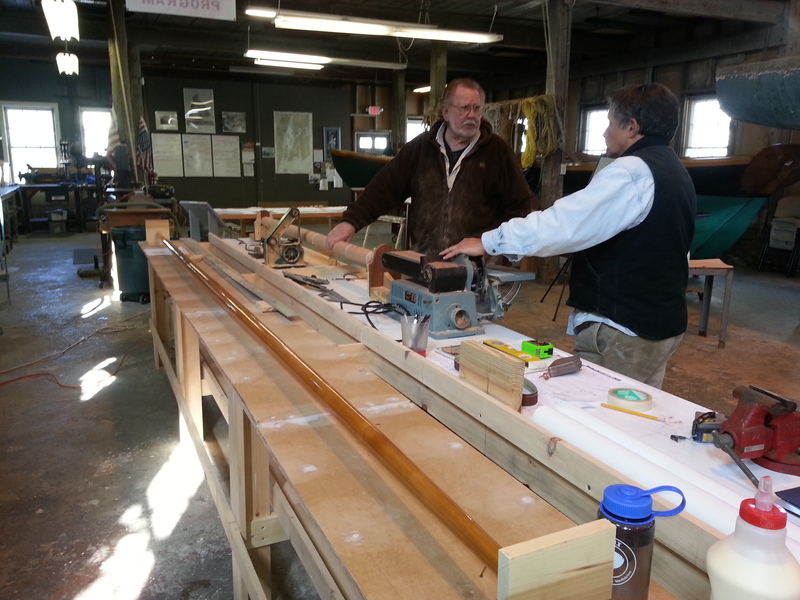 Bill Lawton and Tim Horton working on spinnaker boom and bowsprit. Originals were 83′ and 40′ respectively, approx 14′ and 7′ on the model. The team is researching her spinnaker pole thumbcleats, bowsprit cone/ rigging detail, and attachment of footropes at hull end. Any insights the Reliance Interest Group has are appreciated. This entry was posted in Free Form Discussion and tagged bowsprit, RELIANCE, spinnaker boom on October 25, 2012 by Herreshoff Marine Museum/America's Cup Hall of Fame. Bill Lawton fashions the bowsprit tip. This entry was posted in Builder's Notes & Pictures on October 25, 2012 by Herreshoff Marine Museum/America's Cup Hall of Fame. Preparing to face a new challenge from Sir Thomas Lipton to “lift” the Cup from America the New York Yacht Club faced significant financial issues. Lipton, with a seemingly bottomless purse, was challenging every other year. Defending the Cup had become an expensive proposition. Each new challenge required the NYYC to form a syndicate to build a new defender, as well as additional syndicates to recommission prior year Herreshoff-built Cup winners to campaign against the new boat for the right to defend. This time NYYC Commodore Cass Ledyard had one overriding objective, to beat Sir Thomas so badly that he would go away for a long time. To make that happen they needed the “A Team”. The skillful C. Oliver Iselin to manage the new boat syndicate, Capt. Nat Herreshoff to design and participate in leading the campaign, and the redoubtable Charlie Barr to skipper the boat. Iselin had committed to the task very early in 1902. Capt. Nat and Barr were the problem. In the spring, when Iselin corresponded with Capt. Nat about the forthcoming challenge he received a disturbing response. Nat declined, writing that while he had the greatest respect for Iselin and had enjoyed their previous campaigns, he was no longer up to the rigors of a Cup defense because “my best days are behind me”. The Cup defender would be very demanding of his time on top of an already full order book, his wife was seriously ill and he was suffering from rheumatism. It took Iselin’s best powers of persuasion to change Nat’s’ mind. He also enlisted Commodore Ledyard who assured Nat that the well-funded syndicate had Barr locked up. Nat came onboard, fully committed (as he was to any task that he undertook), creating the magnificent RELIANCE. But Ledyard had written prematurely because Barr had already signed with August Belmont. To break that commitment would be expensive. At a time when the going pay for a Cup skipper was $4,000, Barr was demanding $10,000. Barr was the last to join. The “A Team” was in place. It was well worth the effort to assemble. RELIANCE beat SHAMROCK III in three straight races. Lipton did not challenge again until 1913. This entry was posted in Curator's Notes and tagged A Team, America's Cup, Herreshoff, Nat, RELIANCE on October 24, 2012 by Herreshoff Marine Museum/America's Cup Hall of Fame. On behalf of our RELIANCE Volunteer Team it is my great pleasure to welcome you to our blog with the hope that you’ll join our RELIANCE Interest Group and perhaps volunteer. Our team has formal work sessions Tuesday, Thursday and Saturday morning, with informal activities most every day! The Museum is building a museum quality1/6th scale static display replica of the famous 1903 America’s Cup winner RELIANCE under sail and which will become a cornerstone display and source of related museum exhibits. This model will be 33’ in length and more than 37’ in height. A large number of people around the globe have expressed interest in our Project. The Museum invites you to participate in our RELIANCE Interest Group, either to keep abreast of progress or to contribute your insight. We believe your participation in the Group whether as cheerleader or contributor will be important for our success. Follow the RELIANCE Project Blog to stay informed. We have found that despite the enormous amount of research on RELIANCE over the years building of this museum quality display replica still requires substantive research into RELIANCE, HMCo, period yacht design and manufacture, and large yacht racing techniques in order to complete the model. Given this fact, the RELIANCE Project also represents such an important opportunity for associated educational, cultural, and inspirational exhibits for a broader base of membership and visitors that the Project cannot be deemed a complete success without them. To give the reader an appreciation for the majesty of the original RELIANCE, her hull is twice as long as the hull of the modern America’s Cup boat DEFIANT displayed at the Museum. RELIANCE’s bowsprit and main boom overhang make her almost three times as long! Her masts and topsail yard are twice as high as DEFIANT’s mast. From waterline to tip of topsail yard she is approximately 199’ and thus would barely fit under the 205’ center span clearance of the Newport Bridge and certainly could not fit under the 135’ clearance of Mt. Hope Bridge. This last point may need some explanation. RELIANCE was built and delivered in racing form in just six months, while at the same time HMCo was building sailing dinghies, power craft, and other large racing yachts. Her 100 ton lead keel was poured only 30 days after receipt of order from the Iselin Consortium and construction on her metal hull began less than a month after that. She is, therefore, a most important symbol of integrated advanced design, engineering, and manufacturing capabilities in post-industrial revolution America. HMCo was at the forefront – internationally recognized for its advanced design, engineering and manufacturing capabilities. In fact, manufacturing pioneers such as Henry Ford visited Bristol to gain insights. Please follow The RELIANCE Project Blog and be part of our team. This entry was posted in Project Manager's Welcome and tagged America's Cup, HMCo, RELIANCE on October 24, 2012 by Herreshoff Marine Museum/America's Cup Hall of Fame.